Suddenly, the plan this past weekend was to roast a PERDUE "OVEN STUFFER" Roaster. You guessed it...The Big Y my local supermarket had a special on Perdue Roasters. Moist fragrant slices of chicken... with stuffing graced with gravy... Butternut Squash...a little Cranberry Sauce - Mmm...it almost sounds like a mini Thanksgiving Day Dinner! It sure was! By roasting this larger chicken weighing about 7 lbs., more dinners with chicken would be enjoyed. Chicken a la King! Chunks of Chicken in a creamy sauce along with mixed veggies served over toasted Oatmeal Bread. Yes, with me it's always all about the Oatmeal! After removing the cooked chicken from the bones, the larger bones were saved to prep Chicken Broth. It still sounds similar to Thanksgiving weekend. My Revere Dutch Oven containing water, chicken bones, Bay Leaves and a few shakes of Oregano, Sweet Basil, dehydrated Onion & Parsley simmered for about 2 hours. I was on my way to prep: Chicken a la King. It's always yummy, but using homemade chicken broth makes it even better! I made 4X the recipe listed below. The extra servings are now in my inventory of homemade dinners in the freezer! The Ziploc Freezer Containers are so useful! The $7.50 Roaster yielded 6 dinners including the roasted slices with the trimmings the first night. Remove skillet from Medium heat and slowly stir in Flour. Return to heat and slowly add in Chicken Broth & Milk while slowly stirring constantly. Continue stirring over heat until sauce is thick and bubbly. Stir and heat mixture for 1 - 2 Minutes. Two weeks ago Beef Stew cooked itself in my Slow Cooker after all of the ingredients were added to the pot. It's great to prepare and then enjoy a no fuss meal at dinner. Dinner was definitely hot, hearty and filled with veggies and color! There were extra portions, so enough for dinner servings (again in two days) was placed in the fridge. Then, the remaining veggie filled stew was packed in 2 cup Ziploc Freezer Containers. Into the freezer they went! These homemade nutritious meals waiting in the freezer are perfect for this time of year. Many "common colds" and other viruses are making their rounds...all part of the season. Very happy that my family members did get our flu shots! There can be a day or two when making dinner is not a top priority. On such a day defrosting a nutritious homemade meal tastes even better. As in so many parts of our country, my area has felt the low temps along with the frigid wind chill during the days into nights. A bowl of savory steaming stew just hits the spot on a cold night like these past few nights! No, my Slow Cooker was not in use yesterday. A Ziploc Freezer Container of Beef Stew had been placed in the fridge overnight - to defrost - for last night's dinner. As it reheated in a sauce pot on my stove, about 8 oz. of Tomato Sauce was added. Thick, seasoned, hot, hearty Beef Stew tasted great! A slice of Oatmeal Bread dunked into the rich tomato sauce while enjoying the stew...YUM! Spray Slow Cooker's pot with PAM. Rinse 1 lb. Baby Carrots in cold water. Place on bottom of pot. Rinse about 1 lb. Beef Stewing Meat in cold water. Cut in chunks and place on Carrots. Layer (1) 16 oz. pkg. 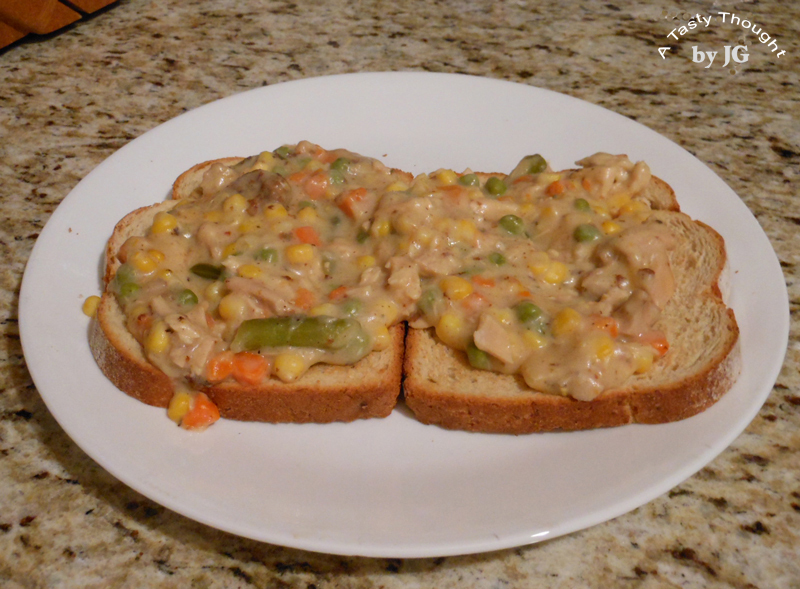 defrosted Mixed Veggies on top. Sprinkle on 1/2 teaspoon Oregano and Basil. Add 1/4 teaspoon Garlic Powder (optional). Wash (1) Potato and cut into chunks. Add. Place (1) 14 oz. can diced Tomatoes on top. Top with 28 oz. Tomato Sauce. Set Temperature on High for 3 Hours. Reduce to Medium for 1 Hour. With my West Bend Slow Cooker I set to #5 and then reduce to #3 and 1/2. Have you enjoyed Beef Stew at dinner this winter? Do you freeze the extra portions to enjoy again? The weekend is a great time to take out your Slow Cooker/Crock Pot! 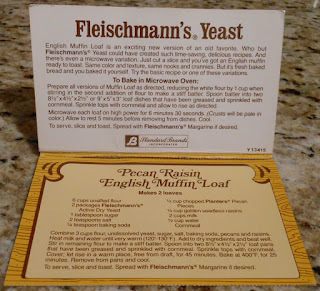 Occasionally it comes to mind...toasting a slice of the English Muffin Loaf recipe published by Fleishmann's ...the aroma of yeast coming from my toaster oven...then eating the delicious buttered slice. No jam needed here! So many years ago when my sons were toddlers, I would bake the "Traditional" version loaves with no fruit, rather than purchase English Muffins at the grocery store. Now, the pressing question for me was...where did I put the recipe? Last week for some unknown reason, I discovered my long misplaced "recipe box". Most of the treasured recipes have been rewritten & enjoyed over and over, again. Some, shared on-line. However, in that box I discovered the recipe that I had not used in so many years. The memories of dough rising in 2 bread pans. Memories of baking bread, also! After locating this lost treasure, my plan...a hearty slice of toasted and buttered Cinnamon Craisin English Muffin Loaf at breakfast the next AM. Add in an Easy Over Egg! I had King Arthur Unbleached Bread Flour + also Yeast, so I was good to go. Yes, Cornmeal could be sprinkled in the pans that were sprayed with PAM and also sprinkled on top of the dough...but flour would have to do - I had no Cornmeal! 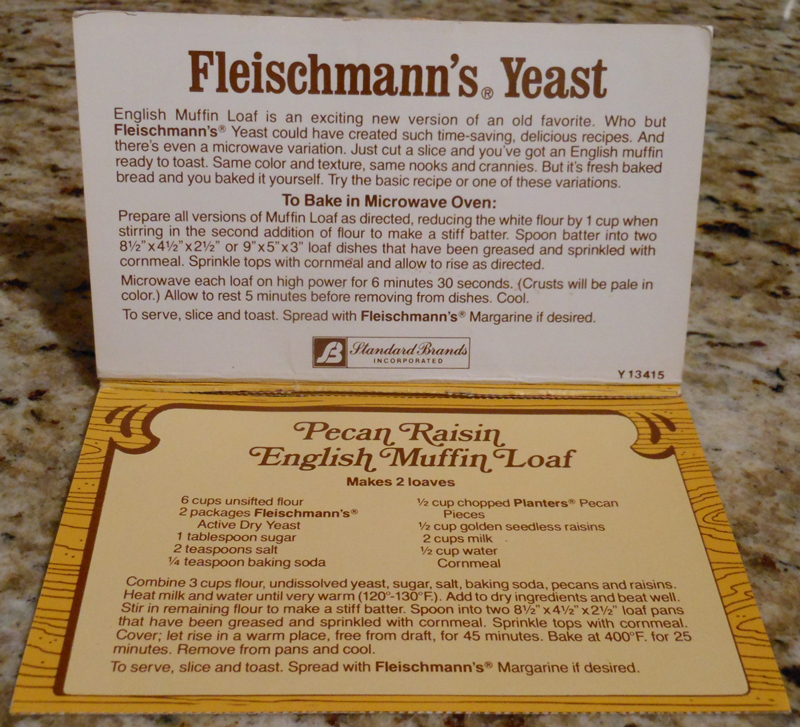 Dried Cranberries were not easily available when this recipe was printed by Fleishmann's. I used the Pecan/ Raisin recipe and substituted Craisins for those two listed ingredients and added Cinnamon. I also used 1/2 teaspoon less Salt than the recipe stated. My heavy duty KitchenAid Mixer was ready! The stiff dough was divided into 2 oval pieces before placing in the PAM sprayed, floured bread pans. A dish towel covered the bread pans, while the dough rose for the 45 minutes. 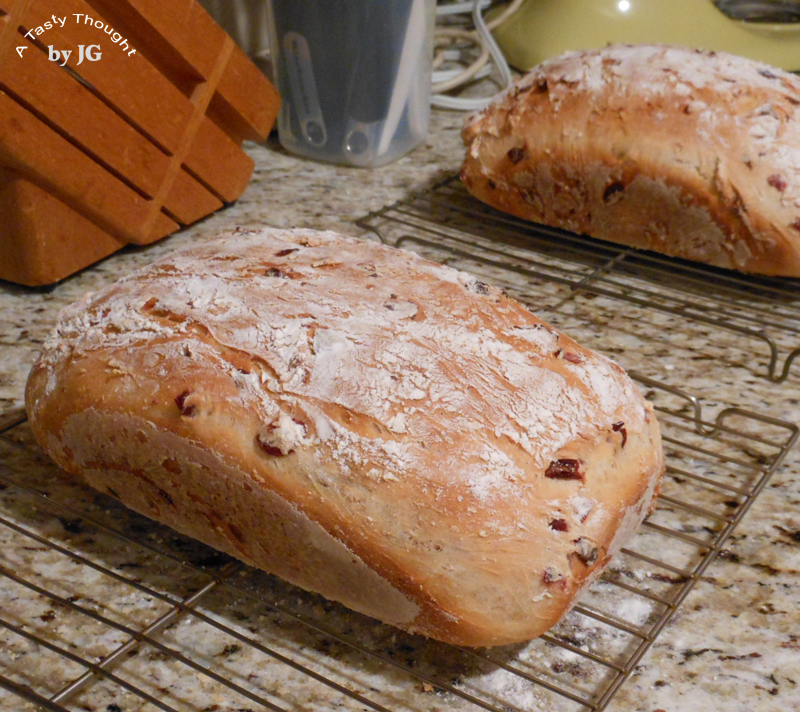 After baking & cooling, the loaves were cut into slices. Definitely some slices were saved for breakfast the next AM! Most of the slices were placed in individual sandwich bags and then Ziploc Freezer Bags - and into our freezer. These slices are really yummy! 2 Cups Milk - I used 1% Milk. Spray 2 Bread Pans with PAM. Sprinkle with Flour or Cornmeal. Place 3 Cups Flour in bowl. Add remaining dry ingredients and combine well. Add heated liquid to dry ingredients. Slowly stir in remaining Flour - 1/2 cup at a time. Divide stiff dough into two balls. Reshape into 2 ovals and place 1 in each bread pan. Sprinkle additional Flour or Cornmeal on top. Cover bread pans with clean dish towel. **Let rise in a warm place for 45 Minutes. Stagger pans in oven and bake 25 Minutes at 400°F. Remove from pans and cool on wire rack. After cooling, cut into slices. *Liquid ingredients must be between 120° - 130°F. Use thermometer to measure temperature. **It was a chilly winter day. To give the dough the opportunity to rise, I turned my oven on to 350°F for 5 minutes. Then, turned the oven off. The dough filled pans covered with a dish towel were placed on my stove for 25 Minutes. Before preheating my oven to 400°F to bake the loaves, I repositioned the 2 pans - off the stove and onto my counter near the side of my stove. The dough rose, as expected in 45 minutes! ***The dough is very stiff. When adding the additional 3 cups Flour, it may need to be stirred in by hand. My KitchenAid Mixer worked great. While the English Muffin Loaves baked, the aroma of yeast filled my home. This definitely brought back memories of baking bread using R2D2 (the name my sons gave to my bread machine)! Time to bring out R2D2! Sweet! 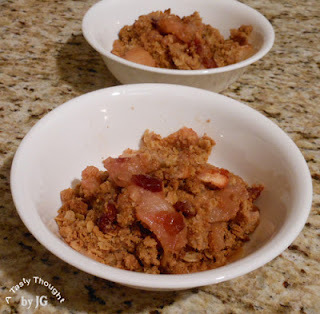 Pear-Apple Craisin Crisp - only needs a small scoop of Vanilla Ice Cream! The 3 ripened Pears attracted my attention whenever I opened our fridge. Well, they were in plain sight located on the top shelf - on the right hand side! Sure, they were ripe, but I was thinking about Apple Crisp. It was at that moment I knew that 2 of those 3 Pears would not keep their spot much longer! 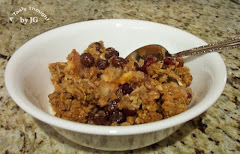 I located my Craisin Raisin Apple Crisp Recipe - omitted the raisins and substituted 2 Pears for 1 Apple. Spray PAM in 8" x 8" glass pan. Place peeled/ sliced Apples in pan. Mix in peeled/ sliced Pears. Thoroughly mix remaining ingredients together in small bowl. Sprinkle this Topping mixture over Apple & Pear slices. Bake 45- 50 Minutes or until Apples/ Pears are tender. Serve warm or chilled with a small scoop of vanilla ice cream. When cool, cover & refrigerate any leftovers. This is a tasty dessert on a winter evening and winter is back! Prep It, Freeze It & Enjoy Again! This week brings many activities! That translates into dinner being "whipped up" quickly. For me it's the perfect opportunity to remember the Ziploc Freezer containers of Sausage Soup waiting in our freezer. One container placed in the fridge to defrost overnight works very well! A can of 14.5 oz. of lower salt/low fat chicken broth is also needed when reheating the cold soup in a pot on the stove. The Rice absorbed the liquid broth as the soup cooled - before freezing. Remove Sausage from casings and brown in skillet. Break Sausage into pieces while it is browning. Place all remaining ingredients into large pot or Dutch Oven. Bring all ingredients to a simmer. Simmer about 45-60 minutes until Rice has cooked. 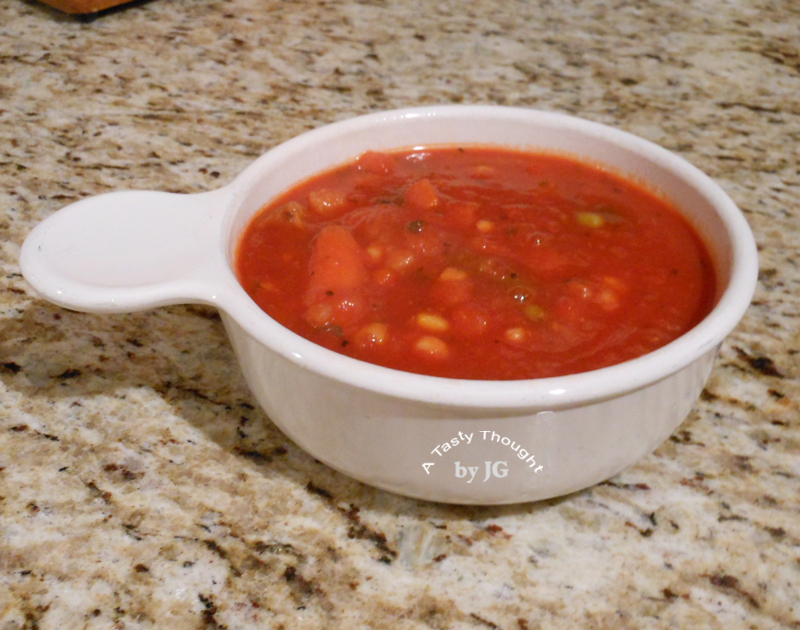 *When reheating refrigerated or defrosted portions, a 14.5 oz. 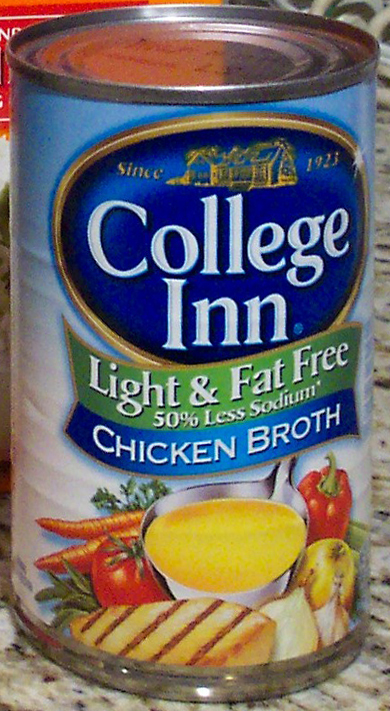 can of College Inn Light & Fat Free Chicken Broth is added to the defrosted contents while the soup reheats on my stove. The Rice has absorbed the liquid. Do you prepare this quick, easy & delicious soup? *It's great to have a "techie" husband! We worked through the image uploading issue today 1/11/13! Woohoo!